Cancer is often viewed as a fundamentally modern and monolithic disease. Many people think its rise and spread has been driven almost exclusively by the developed world’s toxins and poisons; by our bad eating habits, lifestyles, and the very air we breathe. Actually, cancer is not a single disease. It is also far from modern. New fossil evidence suggests that its origins lie deep in prehistory. We recently published two papers in the South African Journal of Science that describe the discovery and diagnosis of the earliest benign tumour and earliest malignant cancer to affect the human family. Tumours and cancers are collectively known as neoplastic diseases. Until now, the oldest evidence of neoplasia in the hominin fossil record dated back 120,000 years. This was found in a rib fragment of a Neanderthal from Krapina in Croatia. But our discovery, in two South African cave sites, offers definitive evidence of cancer in hominins – human ancestors – as far back as 1.7 million years ago. Our research involved two overlapping teams of multi-disciplinary scientists. Some specialised in human evolutionary anatomy, others in ancient and modern diseases. Others are experts in the latest medical and research-based non-invasive imaging techniques. The aim was to marry the work of scientists who focus extensively on the morphology of dry or fossil bone – including bone diseases – with medical specialists who are practised in diagnosing disease in living humans. 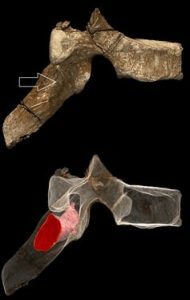 These discoveries were made possible by state-of-the-art 3D imaging techniques. We used Micro-Focus X-ray Computed Tomography, or Micro-CT imaging. This is similar to the more familiar medical CAT scans, but allows a much greater degree of resolution. Another technique, Phase Contrast X-ray Synchrotron Microtomography, was also used. It is widely accepted globally as the global standard for 3D imaging of fossils without causing them any damage. Finding any cancer or neoplastic disease in the archaeological record has always been a contentious issue. Our findings prove that they are wrong. We made two relevant fossil discoveries which falsify their claims. One was an example of a benign tumour and the other a malignant cancer. The benign tumour comes from the site of Malapa, and is dated to 1.98 million years ago. This is a case of osteoid osteoma, a benign bone tumour. It was found in a vertebra of the well-known Australopithecus sediba child Karabo. The tumour would probably have caused pain and discomfort, but would not have been directly responsible for Karabo’s death. However, the disease may have limited his ability to climb and move, and may have been implicated in the manner of his death. Results published in 2015suggest Karabo was the victim of a fall from a height into a natural death trap. The second fossil find is perhaps the more important. 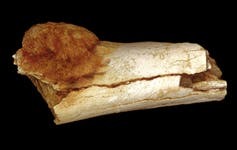 A foot bone from Swartkrans cave provides the earliest evidence for a malignant human cancer, and is dated to roughly 1.7 million years ago. 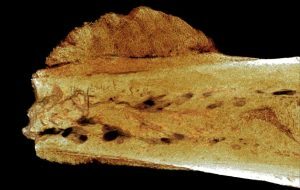 This was seen as a large mass of bone growing on the surface of a fifth metatarsal, which is found in the body of the foot, behind the little toe. The external bone mass might have suggested a benign tumour. But when we looked inside the bone, using advanced Micro-CT imaging, we saw that the medullary cavity – the hollow part of a normal tubular bone – was completely obliterated by new bone growth. This indicated an aggressive bone-forming condition: a cancer. We used advanced imaging techniques that helped us to visualize the pathological lesion better. We were able to identify new bone growth inside the medullary cavity, which expanded through to the surface. We then compared the mass and the cross-section with modern clinical cases and concluded it was an osteosarcoma, a primary bone malignancy. This means that the cancer actually started deep in the bone tissue itself, before spreading to the surface. Such cancers are invariably life-threatening if untreated and would lead to death if allowed to divide and spread. The cancer’s presence might also have affected the hominin’s ability to walk and would have been painful when in contact with the ground. So, is our discovery the earliest evidence for neoplastic disease? In the human lineage, yes. However, much older tumours and cancers have been observed in the fossil record of non-hominins. Cancer is not simply a disease affecting humans. And it is ancient. The earliest unequivocal case of benign neoplasia is an osteoma from 300 million years ago. It was found in a fossil fish from North America. Later cases include benign tumours in Jurassic dinosaurs, Cretaceous hadrosaurs, and later European mammoths. The earliest true cancer comes from a theropod dinosaur from the late Jurassic of Utah in the US. Today various cancers and tumours are prevalent in animals. A parasitic cancer called Devil Facial Tumour Disease has been implicated in the collapse of wild Tasmanian Devil populations. Tasmanian Devils are carnivorous marsupials. In the human world, it is true that rates of tumours and cancers are accelerating because environmental toxins and other tumour forming factors in the modern (particularly Western) lifestyle. But such diseases were present in the past, even without the influence of modern lifestyles. However, by any modern standard these primary bone tumours are very rare. Finding them in two of our fossil ancestors is highly unusual. 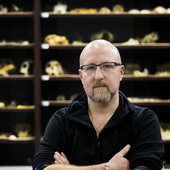 The next step is to ask what mechanisms may be behind the presence of tumours and cancers deep in prehistory and how that may have an impact on the evolution of cancer in the modern world. 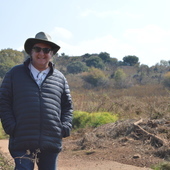 This entry was posted in Cancer, Disease, History, Prehistory. Bookmark the permalink.